- European grade of raw material. Intended for use by patients with osteoarthritis. 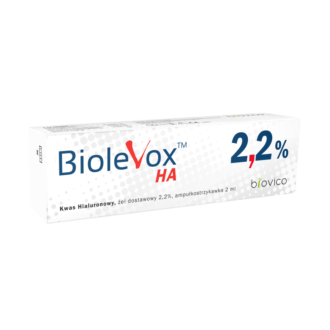 Biolevox HA is a hyaluronic acid, an intraarticular gel 2,2%, a pre-filled syringe 2 ml. Biolevox Ha helps to reduce the pain to facilitate daily activities. 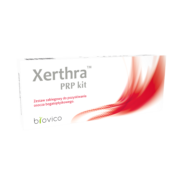 It protects articular cartilage from further degeneration. As one of the few on the Polish market, it contains high concentration of hyaluronic acid. Treatment with three doses may provide more than twice the amount of acid than the other preparations like this. Because of the high hyaluronic acid content in one dose, it does not require an injection of a large volume. Produced in Germany, it maintains the highest quality standards of medical preparations. Intra-articular injection treatment may be carried out only by a doctor. In case of damaged joint (due to injury or arthrosis), the elasticity and viscosity of synovial fluid decreases and that leads to reduced joint mobility, pain, and articular cartilage damage. Supplementing the synovial fluid by injecting the purified hyaluronic acid (Biolevox Ha) into joint improves its elasticity and viscosity. As a result, the joint mobility increases and the level of pain caused by degeneration of articular cartilage decreases after the first treatment cycle. The effects of treatment remain for many months. The number of injections in the treatment is decided by a specialist. The product is sterilized by steam. Do not use in case of damaged sterile packaging. Store at the temperature from 2 to 25 degrees Celsius. Prevent shocks. Sodium hyaluronate, sodium chloride, disodium phosphate, sodium phosphate, water for injection.